Standard (default) - The control is displayed by two parts: Picker and Selector Popup. Inline - The control displays only the Selector part, which is part of the main layout. IsReadOnly (bool): Sets the button to read-only. Its default value is false. MaxValue (DateTime): Sets the maximum available date/time value for selection. ValueString (string): Returns the selected date in its string representation, as it appears within the control. Value (DateTime? 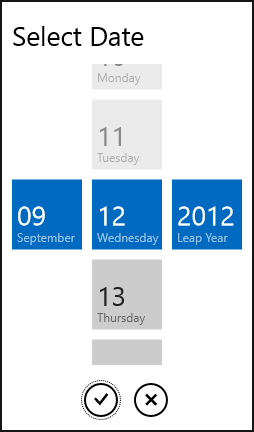 ): Gets or sets the currently selected DateTime. May be null as the property type is of type System.Nullable<DateTime>. DisplayValueFormat (string): Sets the display format string for the date/time value. For example it could be "d-M-yyyy". EmptyContent (object): Sets a value of the Selected Value field when it is empty. EmptyContentTemplate (DataTemplate): Sets a custom template for an Empty Content template. AutoSizeWidth (bool): Gets or sets a bool value indicating whether the control will automatically change its width to match the width of the Selector Popup. CalendarIdentifier (string): Gets or sets the calendar identifier. CalendarLanguage (string): Gets or sets the language of the picker. CalendarNumeralSystem (string): Gets or sets the numeral system of the picker. Step (DateTimeOffset): Gets or sets the step that will be applied to the picker date/time lists. Each list will take the correspomding component fron the DateTimeOffset structure. DayStepBehavior (StepBehavior): Gets or sets a value that defines how the step for the day component is interpreted. MonthStepBehavior (StepBehavior): Gets or sets a value that defines how the step for the month component is interpreted. YearStepBehavior (StepBehavior): Gets or sets a value that defines how the step for the year component is interpreted. CalendarClockIdentifier (string): Gets or sets a value that specifies whether the clock will be 12 or 24-hour.